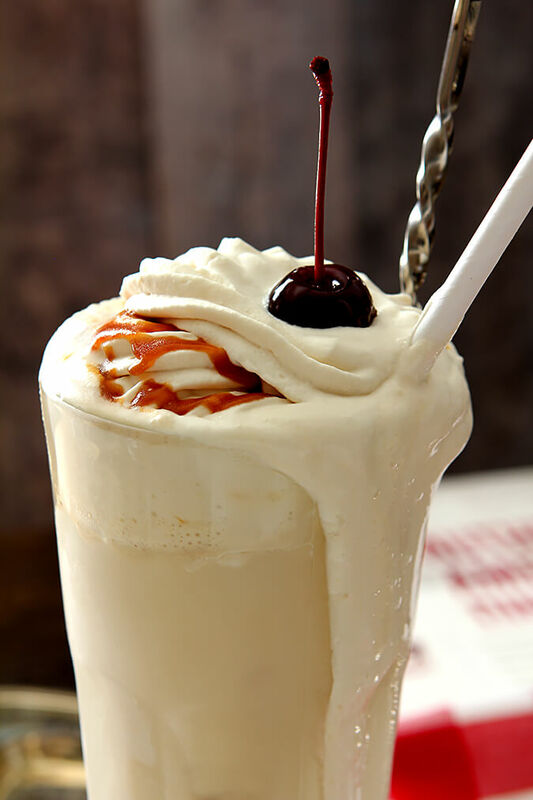 This Boozy Salted Caramel Milkshake is a specialty at Ted’s Montana Grill…and now you can make it at home! Vanilla ice cream, bourbon and caramel; it’s amazing! I am occasionally the lucky recipient of an invitation to visit a local restaurant and try some of their menu items. Obviously not at all in the same way a food critic would sample dishes but as a guest. Their hopes are that I will enjoy a meal and share it with my readers and my sincere hope is that I will too. It does seem the cards in the deck are stacked in their favor, after all they know why I am there so of course they pull out all the stops so you do have to wonder if it’s a fair representation of what a diner could expect right? I would like to believe that I’m discerning enough to be able to see through any smoke and mirrors and develop a real feel for the dining experience but I’m also no pro at this. I want it to be good; I want to say great things; showering negative criticism on any place is not something I would feel good about and so my I stick to that time honored tradition of ‘If you can’t say something nice, don’t say anything at all.’ I’m sharing my experience with you today so yes, you can expect to hear great things! My most recent invitation was to visit one of Ted Turner’s restaurants aptly named Ted’s Montana Grill which has several locations in the Denver metro area. While the memory of the Canyon Creek burger had me over the moon, I knew as soon as I took a sip of dessert that it would be the one recipe I would beg the establishment for. I decry the use of the word swoon used so often by people that it has lost any meaning but in this case, this simple dessert was absolutely swoon-worthy. Exactly how I felt when I first sipped this Boozy Salted Caramel Milkshake! I remember the first time I went to a Ted’s Montana Grill. It was my birthday and they had just recently opened their establishment on Larimer Square in downtown Denver. My girls wanted to take me there so it was a big night out for us. Larimer Square is a charming, bustling block in the heart of Denver; the ever present overhead twinkling lights add an extra element of gaiety and the fact that my birthday is two weeks before Christmas meant things were really popping. Funny I don’t recall what I had that night but I will never forget what my daughter Lauren ordered and is still her favorite, the Kitchen Sink burger which includes American cheese, ham, bacon, grilled onions, mushrooms and a fried egg. The name is clearly perfect. Since that night, they have opened a couple of other locations and I chose to go to one closer to me in my old stomping grounds of Greenwood Village in the Landmark Shopping Center. Good call…loved the proprietor and staff. 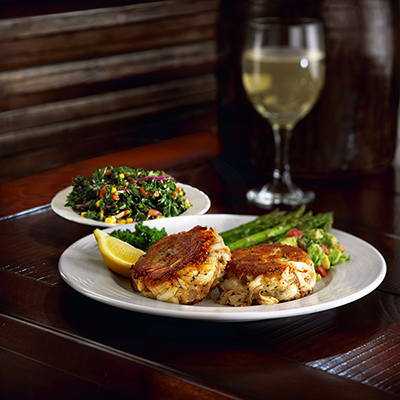 I had invited a friend to join me and Rajean decided to order the St. Phillip’s Island Crab Cakes which boasted a Southwestern seasoning, guacamole, roasted asparagus and kale salad and while I’m not typically keen on fish offerings, I am a big fan of seafood and was sorely tempted to follow her lead. I had a certain ping of envy but that was silly; we’re all about sharing! Rajean gave me a nice large piece to sample and they were amazing. Amazing in that they were filled with crab; not filled with filler. You know what I mean. Tender, moist, lightly seasoned with just a touch of spice, they were absolutely wonderful and we both just loved the horseradish sauce served on the side. A real winner. Still, remembering Lauren’s love of their burger I chose one that was a bit unique and seriously the PERFECT choice for me. 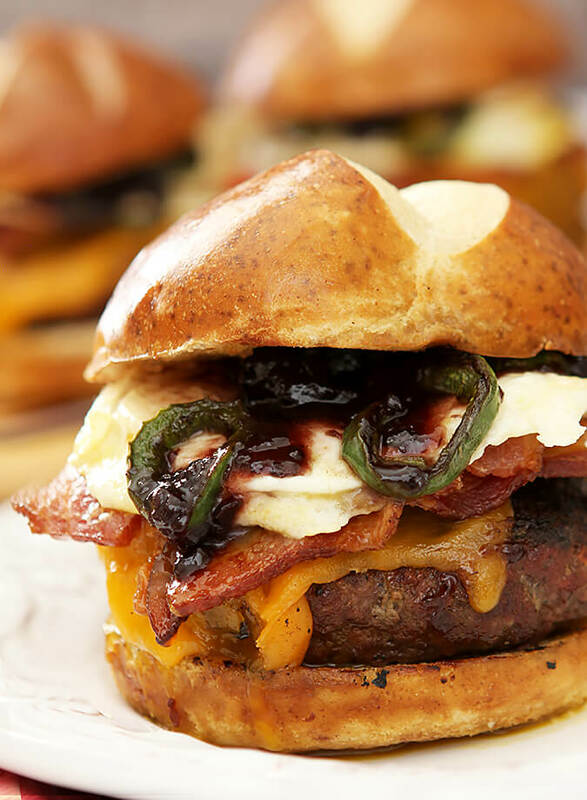 The Canyon Creek burger includes Cheddar cheese, bacon, jalapeno, blackberry jam and a fried egg. I buy a local jam that is blackberry with serrano peppers and I simply love that sweet/hot combination so felt good about going that direction with this burger and I was not wrong. I loved it SO much that I eventually made my own version at home…you really must make this Canyon Creek Burger too! Each burger has the option of beef or bison; I did bison on my birthday so this day I went all beef. I do remember hoping I had not erred in this choice. But…no wait, BUT I just loved this burger. I say this without reservation; I think it was the best burger I’ve ever had. Juicy enough that I had to remain watchful and not embarrass myself with rivers of deliciousness running down my shirt and a flavor combination that was everything I had hoped for. I thought this was the Kitchen Sink and more. So much more that I could barely make it through half even after sharing some with Rajean. I think I had some fries on the side but that swooning thing? Yes, it happened here too! Kyle, the proprietor, was great. Not just attentive but warm and friendly too. He shared some of his personal path towards ending up at Ted’s and his enthusiasm for the company was palpable. He told us how involved Mr. Turner is with the business and that ‘Aunt Fannie’s’ Squash Casserole is really and truly his aunt’s dish. Rajean wasn’t sure she had ever had a squash casserole before and within minutes a sample appeared for her to try. 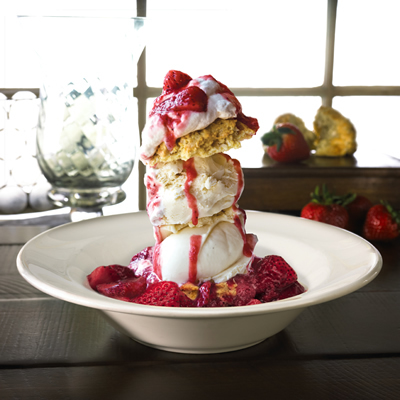 Highly recommended was their Strawberry Shortcake, delivered in a tall stack with house made drop biscuits, vanilla ice cream, fresh strawberry sauce and whipped cream. It reminded me of what I make for my family with the drop biscuits and the truth is it was enough for a family on that one plate! Loved it. It really was enough for a crowd and we were full so…oh shoot who am I kidding? We ate it all. Good thing we were sharing! BUT, but, but…nothing prepared me for the Salted Caramel Shake listed under ‘Adult Shakes.’ Oh my. Simple too…which is why I requested (OK, begged) for the recipe. Please, please, please??? No secret I love using bourbon in desserts but often there is just the slight hint. This was no hint. This was a for real bourbon kick. Rajean and I are adults but I think there might have been a bit of ‘no it’s MINE’ going on…it really was that good. I already imagined it for Friday Cocktails and have been anxious to share but well, the Kentucky Derby really does require a Mint Julep so patience was required. Now the day is here and it’s not to be missed. Easy too. OK, maybe you won’t have your own milkshake machine (yay for garage sales!) but a blender will do nicely. While I did make my own caramel sauce (and added 2 tablespoons of bourbon) you do not have to. Just buy a good brand at the grocery store. Do try making your whipped cream using brown sugar; it’s great with the bourbon. Ted’s recipe includes Haagen-Dazs ice cream and Jack Daniel’s whiskey but I used my favorite everyday bourbon, Makers Mark. As long as you include some good vanilla bean ice cream the spirit is up to you. Still, the real bottom line? You must try this. I saved some for Amy, my neighbor across the street. She of the, ‘not sure I love bourbon’ type? Well in less than a week I’ve got her loving Mint Juleps and this shake….how do you like bourbon now my dear?? Make a date to go to your nearest Ted’s Montana Grill. If you’re close to the Tech Center? Make your reservation but be sure to let Kyle know I sent you; he promises you won’t be sorry. We weren’t; I think I’m still full! Chill a tall glass in the freezer. 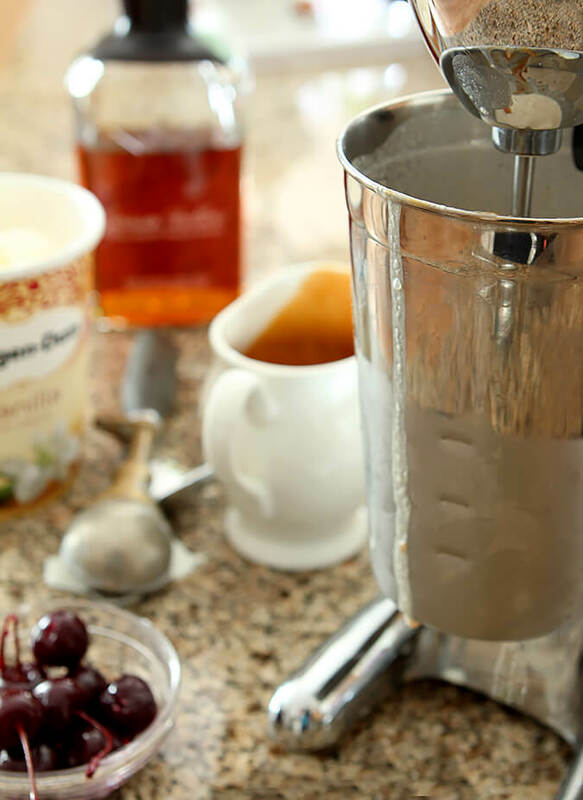 Mix the ice cream, half and half, caramel sauce, bourbon and salt in a milkshake machine or blender. Pour mixture into chilled glass. Top with whipped cream, drizzle with a bit of caramel sauce and top with a cherry. Serve with a tall spoon and a straw. Sadly this recipe is named in correctly. Jack is not bourbon, tastes nothing like bourbon, smells nothing like bourbon! This is a jack Daniels and salted caramel milkshake! Jack is a filtered through charcoal Tennessee WHISKEY! Bourbon is so much better! Well if I was the type to want to split hairs I would have to respond and tell you that you are the one who is wrong; the recipe is not named incorrectly. Boozy is not defined by any regulations as clearly as bourbon is. But you are correct that they are different so I will change the post in the ONE notation where I failed to specify that either whiskey or bourbon could be used; Ted’s might use Jack but I used Maker’s Mark. Love your recipes I used to go to Denver wish I lived there now with all those fine places to eat! But we also have nice places here in N.C. I lived in NC for 10 years; that was 29 years ago so I can only imagine how much it has changed but I know the food was always good. Ah…memories. OMG! The burger and Strawberry Shortcake looks amazing! That must be great pleasure to try this. It would be so cool to be invited to try out some restaurants! Looks like an amazing meal and an even better milkshake! It has been a fun perk Laura especially when it’s such a great place! That smoked trout dip and burger at Ted Montana’s Grill looks amazing. I had to check out their menu. 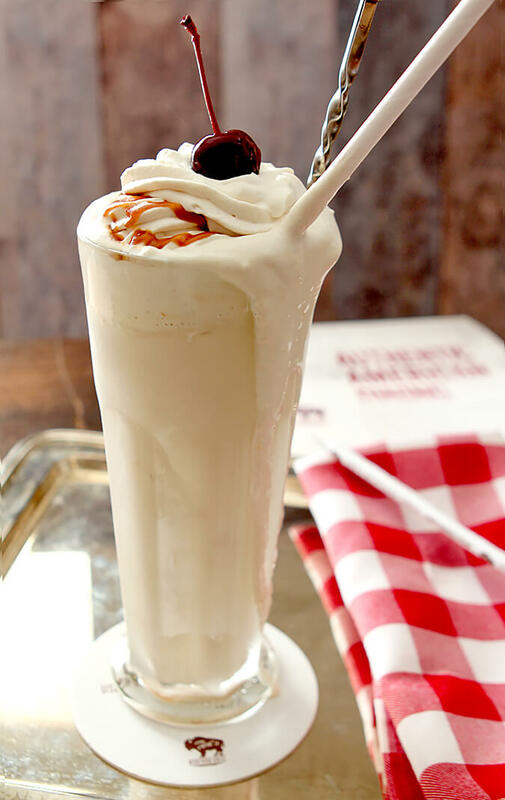 Plus this boozy caramel shake looks quite amazing too. I’ve never had anything there that I didn’t just love but that trout was terrific; I’ll being doing a post about it as soon as I can pull out my smoker. I got it cleaned up today. I’m ready! Um, booze and salty caramel!!! YESSSSSS! This looks fantastic! Wow, the strawberry shortcake looks amazing! I love how they present it. I love the idea of adding bourbon to my shake. I’ll give it a try tonight! This looks so good. A little bourbon never hurt anything. Absolutely never; in my mind it’s always a helper! This looks delicious, perfect for summer! Thanks for sharing! It is just that Florian; but be prepared to find the hammock, OK? Thank you for writing about blogger restaurant invitations. Whenever I get one I worry about the same thing. For instance, not too long ago I was invited to bring along 3 guests for dinner at a celebrity chef’s place. We arrived and they had their best server at our table (only) for the entire night. The bill was nearly $600. How can I evaluate what normal people get where service is considered? I ended up going back with John’s dad with a booking not in my name. They recognized me at the door. 🙁 I’d rather not do restaurant writeups unless I pay my way. That said, I would have enjoyed your meal and this shake is nifty. I’ve also been the lucky recipient of invitations to a new local place. Yes we were feted like royalty but I went to meet a friend there for drinks one evening and the food and the service were still outstanding. I also heard from several people who went on my recommendation how happy they were at discovering it so I think you have to look beyond some of the expected; the food and the service and get a feel for the crowd and the ambiance and in our case an obvious and very real love of the place that we read with Kyle, the proprietor at Ted’s. While at Ted’s I have to say that the packed lunchroom was one indicator that it wasn’t just special treatment…and my first and subsequent visits until recently were on my own too so I had a pretty good idea what to expect and it was good! The most benevolent part of this last visit actually was the attention from the proprietor which gave us an opportunity to get some behind the scenes information which I loved. Somewhere for us it really does have to be about instinct and intuition on top of really loving the food. Hey, we’re wise enough for that, right? Well you know how infrequently I go out to eat but this is now on the TOP of my short list and I know what I’ll be ordering– a burger and this shake! A perfect meal elevated. Your shake turned out beautifully and I can see why your neighbor enjoyed it too. What a great looking shake! I don’t have nearly enough adult shakes in my life. 😉 Sounds like a fun restaurant too — glad you enjoyed yourself! Love it when a reader confirms my impression because I seriously only write about the experiences I love!